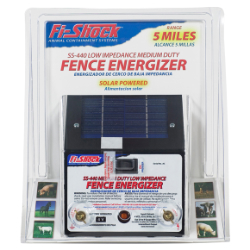 The low-impedance technology in this fence charger means less drain on the battery! It resists shorts when the fence is in contact with weeds. The solar panel features compartmental damage-resistant construction. It has intermittent DC output and a range of 10 acres under ideal conditions.